The relatively new Columban mission in Japan was continuing its great work. In late 1955, Columban Father George J. Bellas, oversaw the opening of Boys Town near Kumamoto, Japan and began as its first director. This foundation, modeled after the legendary Boys Town of Omaha, was an educational institution for troubled, abandoned, and orphaned boys from the ages of seven to eighteen, many of whom were originally housed in other Catholic orphanages in Japan. It received a great deal of support from the U.S. Armed Forces in Japan. The students at Boys Town learned various vocational trades, as well as standard school subjects such as reading and mathematics. 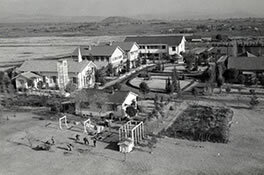 The Columbans later transferred Boys Town to an order of Japanese Sisters. Nonetheless, the Columban work at Boys Town Japan gave a helping hand to countless disadvantages Japanese youth. At least one of the students at Boys Town, Takayoshi Watanabe, became a Catholic priest. Sign up to receive the Daily Prayer, Monthly eNewsletter or other news and information from the Columban Fathers. The Columbans are a society of missionaries, including priests and lay people, who minister to people of various cultures as a way of witnessing to the universal love of God. We go in the name of the Church to announce, by deed and word, the Good News of Jesus Christ. The Missionary Society of St. Columban (a.k.a. St. Columban's Foreign Mission Society, a.k.a. Columban Fathers) is a not-for-profit corporation organized for religious, educational and charitable purposes, and as such is exempt from Federal Income Tax under §501(c)(3) of the Internal Revenue Code.